The Jokhang (Tibetan: ཇོ་ཁང།, Chinese: 大昭寺), also known as the Qoikang Monastery, Jokang, Jokhang Temple, Jokhang Monastery and Zuglagkang (Tibetan: གཙུག་ལག་ཁང༌།, Wylie: gtsug-lag-khang, ZYPY: Zuglagkang or Tsuklakang), is a Buddhist temple in Barkhor Square in Lhasa, the capital city of Tibet. Tibetans, in general, consider this temple as the most sacred and important temple in Tibet. The temple is currently maintained by the Gelug school, but they accept worshipers from all sects of Buddhism. The temple's architectural style is a mixture of Indian vihara design, Tibetan and Nepalese design. The Jokhang was founded during the reign of King Songtsen Gampo. According to tradition, the temple was built for the king's two brides: Princess Wencheng of the Chinese Tang dynasty and Princess Bhrikuti of Nepal. Both are said to have brought important Buddhist statues and images from China and Nepal to Tibet, which were housed here, as part of their dowries. The oldest part of the temple was built in 652. Over the next 900 years, the temple was enlarged several times with the last renovation done in 1610 by the Fifth Dalai Lama. Following the death of Gampo, the image in Ramcho Lake temple was moved to the Jokhang temple for security reasons. When King Tresang Detsen ruled from 755 to 797, the Buddha image of the Jokhang temple was hidden, as the king's minister was hostile to the spread of Buddhism in Tibet. During the late ninth and early tenth centuries, the Jokhang and Ramoche temples were said to have been used as stables. In 1049 Atisha, a renowned teacher of Buddhism from Bengal taught in Jokhang. Around the 14th century, the temple was associated with the Vajrasana in India. In the 18th century the Qianlong Emperor of the Qing dynasty, following the Gorkha-Tibetan war in 1792, did not allow the Nepalese to visit this temple and it became an exclusive place of worship for the Tibetans. During the Chinese development of Lhasa, the Barkhor Square in front of the temple was encroached. During the Cultural Revolution, Red Guards attacked the Jokhang temple in 1966 and for a decade there was no worship. Renovation of the Jokhang took place from 1972 to 1980. In 2000, the Jokhang became a UNESCO World Heritage Site as an extension of the Potala Palace (a World Heritage Site since 1994). Many Nepalese artists have worked on the temple's design and construction. The temple, considered the "spiritual heart of the city" and the most sacred in Tibet, is at the center of an ancient network of Buddhist temples in Lhasa. It is the focal point of commercial activity in the city, with a maze of streets radiating from it. The Jokhang is 1,000 metres (3,300 ft) east of the Potala Palace. Barkhor, the market square in central Lhasa, has a walkway for pilgrims to walk around the temple (which takes about 20 minutes). Barkhor Square is marked by four stone sankang (incense burners), two of which are in front of the temple and two in the rear. Rasa Thrulnag Tsuklakang ("House of Mysteries" or "House of Religious Science") was the Jokhang's ancient name. When King Songtsen built the temple his capital city was known as Rasa ("Goats"), since goats were used to move earth during its construction. After the king's death, Rasa became known as Lhasa (Place of the Gods); the temple was called Jokhang—"Temple of the Lord"—derived from Jowo Shakyamuni Buddha, its primary image. The Jokhnag's Chinese name is Dazhao; it is also known as Zuglagkang, Qoikang Monastery Tsuglakhang and Tsuglhakhange. Tibetans viewed their country as a living entity controlled by srin ma (pronounced "sinma"), a wild demoness who opposed the propagation of Buddhism in the country. To thwart her evil intentions, King Songtsen Gampo (the first king of a unified Tibet) developed a plan to build twelve temples across the country. The temples were built in three stages. In the first stage central Tibet was covered with four temples, known as the "four horns" (ru bzhi). Four more temples, (mtha'dul), were built in the outer areas in the second stage; the last four, the yang'dul, were built on the country's frontiers. The Jokhang temple was finally built in the heart of the srin ma, ensuring her subjugation. To forge ties with neighboring Nepal, Songtsen Gampo sent envoys to King Amsuvarman seeking his daughter's hand in marriage and the king accepted. His daughter, Bhrikuti, came to Tibet as the king's Nepalese wife (tritsun; belsa in Tibetan). The image of Akshobhya Buddha (or Mikyoba), which she had brought as part of her dowry, was deified in a temple in the middle of a lake known as Ramoche. Gampo, wishing to obtain a second wife from China, sent his ambassador to Emperor Taizong (627–650) of the Tang dynasty for one of his daughters. Taizong rejected the king's proposal, considering Tibetans "barbarians", and announced the marriage of one of his daughters to the king of Duyu, a Hun. 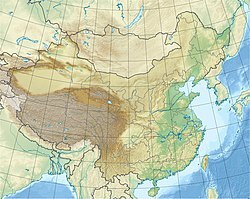 This infuriated Gampo, who mounted attacks on tribal areas affiliated with the Tang dynasty and then attacked the Tang city of Songzhou. Telling the emperor that he would escalate his aggression unless the emperor agreed to his proposal, Gampo sent a conciliatory gift of a gold-studded "suit of armour" with another request for marriage. Taizong conceded, giving Princess Wencheng to the Tibetan king. 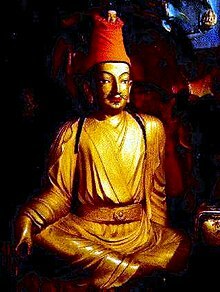 When Wencheng went to Tibet in 640 as the Chinese wife of the king (known as Gyasa in Tibet), she brought an image of Sakyamuni Buddha as a young prince. The image was deified in a temple originally named Trulnang, which became the Jokhang. The temple became the holiest shrine in Tibet and the image, known as Jowo Rinpoche, has become the country's most-revered idol. The temple's design and construction are attributed to Nepalese craftsmen. After Songtsen Gampo's death, Queen Wencheng reportedly moved the statue of Jowo from the Ramoche temple to the Jokhang temple to secure it from Chinese attack. The part of the temple known as the Chapel was the hiding place of the Jowo Sakyamuni. During the reign of King Tresang Detsan from 755 to 797, Buddhists were persecuted because the king's minister, Marshang Zongbagyi (a devotee of Bon), was hostile to Buddhism. During this time the image of Akshobya Buddha in the Jokhang temple was hidden underground, reportedly 200 people failed to locate it. The images in the Jokhang and Ramoche temples were moved to Jizong in Ngari, and the monks were persecuted and driven from Jokhang. During the anti-Buddhist activity of the late ninth and early tenth centuries, the Jokhang and Ramoche temples were said to be used as stables. In 1049 Atisha, a renowned teacher of Buddhism from Bengal who taught in Jokhang and died in 1054, found the "Royal Testament of the Pillar" (Bka' chems ka khol ma) in a pillar at Jokhang; the document was said to be the testament of Songtsen Gampo. Beginning in about the 14th century, the temple was associated with the Vajrasana in India. It is said that the image of Buddha deified in the Jokhang is the 12-year-old Buddha earlier located in the Bodh Gaya Temple in India, indicating "historical and ritual" links between India and Tibet. Tibetans call Jokhang the "Vajrasana of Tibet" (Bod yul gyi rDo rje gdani), the "second Vajrasana" (rDo rje gdan pal} and "Vajrasan, the navel of the land of snow" (Gangs can sa yi lte ba rDo rje gdani). After the occupation of Nepal by the Gorkhas in 1769, during the Gorkha-Tibetan war in 1792 the Qianlong Emperor of the Qing dynasty drove the Gorkhas from Tibet and the Tibetans were isolated from their neighbors. The period, lasting for more than a century, has been called "the Dark Age of Tibet". Pilgrimages outside the country were forbidden for Tibetans, and the Qianlong Emperor suggested that it would be equally effective to worship the Jowo Buddha at the Jokhang. During the Cultural Revolution, Red Guards attacked the Jokhang in 1966 and for a decade there was no worship in Tibetan monasteries. Renovation of the Jokhang began in 1972, and was mostly complete by 1980. After this and the end of persecution, the temple was re-consecrated. It is now visited by a large number of Tibetans, who come to worship Jowo in the temple's inner sanctum. During the Revolution, the temple was spared destruction and was reportedly boarded up until 1979. At that time, portions of the Jokhang reportedly housed pigs, a slaughterhouse and Chinese army barracks. Soldiers burned historic Tibetan scriptures. For a time, it was a hotel. Two flagstone doring (inscribed pillars) outside the temple, flanking its north and south entrances, are worshiped by Tibetans. The first monument, a March 1794 edict known as the "Forever Following Tablet" in Chinese, records advice on hygiene to prevent smallpox; some has been chiseled out by Tibetans who believed that the stone itself had curative powers. The second, far older, pillar is 5.5 metres (18 ft) high with a crown in the shape of a palace and an inscription dated 821 or 822. The tablet has a number of names; "Number One Tablet in Asia", "Lhasa Alliance Tablet", "Changing Alliance Tablet", "Uncle and Nephew Alliance Tablet" and the "Tang Dynasty-Tubo Peace Alliance Tablet".) Its inscription, in Tibetan and Chinese, is a treaty between the Tibetan king Ralpacan and the Chinese emperor Muzong delineating the boundary between their countries. Both inscriptions were enclosed by brick walls when Barkhor Square was developed in 1985. The Sino-Tibetan treaty reads, "Tibet and China shall abide by the frontiers of which they are now in occupation. All to the east is the country of Great China; and all to the west is, without question, the country of Great Tibet. Henceforth on neither side shall there be waging of war nor seizing of territory. If any person incurs suspicion he shall be arrested; his business shall be inquired into and he shall be escorted back". On February 17, 2018, the temple caught fire at 6:40 p.m. (local time), before sunset in Lhasa, with the blaze lasting until late that evening. Although photos and videos about the fire were spread on Chinese social media, which showed the eaved roof of a section of the building lit with roaring yellow flames and emitting a haze of smoke, these images were quickly censored and disappeared. The official newspaper Tibet Daily briefly claimed online that the fire was "quickly extinguished" with "no deaths or injuries" at the late night, while The People's Daily published the same words online and added that there had been "no damage to relics" in the temple; both of these reports contained no photos. The temple was temporarily closed after the fire but were reopened to public on February 18, according to official Xinhua news agency. But the yellow draperies had been newly hung behind the temple's central image, the Jowo statue. And no one was allowed to enter the second floor of the temple, according to the source of Radio Free Asia's Tibetan Service. The fire burned an area of about 50 square meters. The temple's golden cupola had been removed to guard against any collapse and protective supports had been added around the Jowo statue, according to Xinhua. On February 19, 2018, the Dalai Lama's supporters based in India reported eyewitness accounts that "the source of the fire is not the Jowo chapel but from an adjacent chapel within the Jokhang temple premises known in Tibetan as Tsuglakhang" and confirming that there were "no casualties and damage to property is yet to be ascertained". The temple has an east-west orientation, facing Nepal to the west in honour of Princess Bhrikuti. Additionally, the monastery's main gate faces west. The Jokhang is aligned along an axis, beginning with an arch gate and followed by the Buddha Hall, an enclosed passage, a cloister, atriums and a hostel for the lamas (monks). Inside the entrance are four "Guardian Kings" (Chokyong), two on each side. The main shrine is on the ground floor. On the first floor are murals, residences for the monks and a private room for the Dalai Lama, and there are residences for the monks and chapels on all four sides of the shrine. The temple is made of wood and stone. Its architecture features the Tibetan Buddhist style, with influences from China, Indian vihara design and Nepal. The roof is covered with gilded bronze tiles, figurines and decorated pavilions. The central Buddha Hall is tall, with a large, paved courtyard. A porch leads to the open courtyard, which is two concentric circles with two temples: one in the outer circle and another in the inner circle. The outer circle has a circular path, with a number of large prayer wheels (nangkhor); this path leads to the main shrine, which is surrounded by chapels. Only one of the temple murals remains, depicting the arrival of Queen Wencheng and an image of the Buddha. The image, brought by the king's Nepalese wife and initially kept at Ramoche, was moved to Jokhang and kept in the rear center of the inner temple. This Buddha has remained on a platform since the eighth century; on a number of occasions, it was moved for safekeeping. The image, amidst those of the king and his two consorts, has been gilded several times. In the main hall on the ground floor is a gilded bronze statue of Jowo Sakyamuni, 1.5 metres (4 ft 11 in) tall, representing the Buddha at age twelve. The image has a bejeweled crown, cover around its shoulder, a diamond on its forehead and wears a pearl-studded garment. The Buddha is seated in a lotus position on a three-tiered lotus throne, with his left hand on his lap and his right hand touching the earth. A number of chapels surround the Jowo Sakayamuni, dedicated to gods and bodhisattvas. The most important bodhisattva here is the Avalokiteshwara, the patron saint of Tibet, with a thousand eyes and a thousand arms. Flanking the main hall are halls for Amitabha (the Buddha of the past) and Qamba (the Buddha of the future). Incarnations of Sakyamuni are enshrined on either side of a central axis, and the Buddha's warrior guard is in the middle of the halls on the left side. In addition to walking around the temple and spinning prayer wheels, pilgrims prostrate themselves before approaching the main deity; some crawl a considerable distance to the main shrine. The prayer chanted during this worship is "Om mani padme hum" (Hail to the jewel in the lotus). Pilgrims queue on both sides of the platform to place a ceremonial scarf (katak) around the Buddha's neck or touch the image's knee. A walled enclosure in front of the Jokhang, near the Tang Dynasty-Tubo Peace Alliance Tablet, contains the stump of a willow known as the "Tang Dynstay Willow" or the "Princess Willow". The willow was reportedly planted by Princess Wencheng. The Jokhang has a sizable, significant collection of cultural artifacts, including Tang-dynasty bronze sculptures and finely-sculpted figures in different shapes from the Ming dynasty. Among hundreds of thangkas, two notable paintings of Chakrasamvara and Yamanataka date to the reign of the Yongle Emperor; both are embroidered on silk and well-preserved. The collection also has 54 boxes of Tripiṭaka printed in red, 108 carved sandalwood boxes with sutras and a vase (a gift from the Qianlong Emperor) used to select the Dalai Lama and the Panchen Lama. ^ a b Mayhew, Kelly & Bellezza 2008, p. 96. ^ a b Dorje 2010, p. 160. ^ Klimczuk & Warner2009, p. 34. ^ a b c d An 2003, p. 69. ^ McCue 2011, p. 67. ^ a b Mayhew, Kelly & Bellezza 2008, p. 102. ^ Dalton 2004, p. 55. ^ Barron 2003, p. 487. ^ a b Perkins 2013, p. 986. ^ Service 1983, p. 120. ^ "Contrary to Reports, Fire not at Jokhang Chapel: Central Tibetan Administration". Central Tibetan Administration. 18 February 2018. Retrieved 2018-02-18. Dharamsala; In light of the news reports of a massive fire that was believed to have emerged from Jokhang chapel (chapel that houses the Jowo-Buddha Shakyamui statue) in the temple premises, in the heart of Lhasa city, reliable sources have told the Central Tibetan Administration leadership that the source of the fire is not the Jowo chapel but from an adjacent chapel within the Jokhang temple premises known in Tibetan as Tsuglakhang. Images and videos circulating last evening on social media show the Jokhang temple premises, one of the holiest Buddhist temples in Tibet engulfed in flames. A bystander is heard wailing and chanting a prayer in the name of Tenzin Gyatso (the 14th Dalai Lama). It is reported that the fire that broke out at 6:40 pm (Lhasa time) was extinguished and there was no casualties and damage to property is yet to be ascertained. CTA President Dr Lobsang Sangay who is currently on a six-day official visit to Japan sighed relief that the fire did not affect Jokhang chapel but cautioned Tibetans in Tibet to remain alert at large public gatherings especially during occasions such as Losar. “At this point in time I cannot comment much until the cause of the fire is brought to light, but it is disturbing to see tragic accidents take place at Jokhang temple premises, one of the most hallowed sites in Tibet and a UNESCO World Heritage site,” lamented Ven Karma Gelek Yuthok, Minister for Religion and Culture. ^ a b "Jokhang Temple, Lhasa". sacred-destinations.com. Retrieved 28 September 2015. ^ Powers 2007, p. 233. ^ a b Powers 2007, p. 146. ^ a b Brockman 2011, p. 263. ^ a b c d Davidson & Gitlitz 2002, p. 339. ^ a b c Buckley 2012, p. 142. ^ Tibetan Religions. 五洲传播出版社. 2003. pp. 36–. ISBN 978-7-5085-0232-8. ^ a b Barnett 2010, p. 161. ^ Jabb 2015, p. 55. ^ Huber 2008, p. 119. ^ Huber 2008, p. 233. ^ Laird 2007, p. 39. ^ a b c An 2003, p. 72. ^ a b Representatives 1994, p. 1402. ^ a b Buckley 2012, p. 143. ^ "China destroys the ancient Buddhist symbols of Lhasa City in Tibet". Tibet Post. 9 May 2013. Retrieved 29 September 2015. ^ Buckley, Chris (17 February 2018). "Fire Strikes Hallowed Site in Tibet, the Jokhang Temple in Lhasa". New York Times. Retrieved 18 February 2018. ^ "Fire-hit Jokhang temple streets reopen after blaze at Tibet holy site". AFP. 19 February 2018. Retrieved 19 February 2018. ^ Finney, Richard (2018-02-20). "Tibet's Jokhang Temple Closes For Three Days, Raising Concerns Over Damage". Radio Free Asia. Retrieved 21 February 2018. ^ "China says fire in sacred Tibetan monastery not arson". The Associated Press. 22 February 2018. Retrieved 23 February 2018. ^ "Contrary to Reports, Fire not at Jokhang Chapel". Central Tibetan Administration. February 19, 2018. Retrieved March 25, 2018. ^ a b An 2003, p. 69-70. ^ a b "Historic Ensemble of the Potala Palace, Lhasa". UNESCO Organization. Retrieved 29 September 2015. ^ a b c d e Davidson & Gitlitz 2002, p. 340. ^ An 2003, p. 69-71. ^ Brockman 2011, p. 263-64. ^ An 2003, p. 70. ^ a b An 2003, p. 71. ^ Mayhew, Kelly & Bellezza 2008, p. 103. An, Caidan (2003). Tibet China: Travel Guide. 五洲传播出版社. ISBN 978-7-5085-0374-5. Barnett, Robert (2010). Lhasa: Streets with Memories. Columbia University Press. ISBN 978-0-231-13681-5. Barron, Richard (10 February 2003). The Autobiography of Jamgon Kongtrul: A Gem of Many Colors. Snow Lion Publications. ISBN 978-1-55939-970-8. Brockman, Norbert C. (13 September 2011). Encyclopedia of Sacred Places. ABC-CLIO. ISBN 978-1-59884-655-3. Buckley, Michael (2012). Tibet. Bradt Travel Guides. ISBN 978-1-84162-382-5. Dalton, Robert H. (2004). Sacred Places of the World: A Religious Journey Across the Globe. Abhishek. ISBN 978-81-8247-051-4. Davidson, Linda Kay; Gitlitz, David Martin (2002). Pilgrimage: From the Ganges to Graceland : an Encyclopedia. ABC-CLIO. ISBN 978-1-57607-004-8. Dorje, Gyurme (2010). Jokhang: Tibet's Most Sacred Buddhist Temple. Edition Hansjorg Mayer. ISBN 978-5-00-097692-0. Huber, Toni (15 September 2008). The Holy Land Reborn: Pilgrimage and the Tibetan Reinvention of Buddhist India. University of Chicago Press. ISBN 978-0-226-35650-1. Jabb, Lama (10 June 2015). Oral and Literary Continuities in Modern Tibetan Literature: The Inescapable Nation. Lexington Books. ISBN 978-1-4985-0334-1. Klimczuk, Stephen; Warner, Gerald (2009). Secret Places, Hidden Sanctuaries: Uncovering Mysterious Sites, Symbols, and Societies. Sterling Publishing Company, Inc. ISBN 978-1-4027-6207-9. Laird, Thomas (10 October 2007). The Story of Tibet: Conversations with the Dalai Lama. Grove Press. ISBN 978-0-8021-4327-3. Mayhew, Bradley; Kelly, Robert; Bellezza, John Vincent (2008). Tibet. Ediz. Inglese. Lonely Planet. ISBN 978-1-74104-569-7. McCue, Gary (1 March 2011). Trekking Tibet. The Mountaineers Books. ISBN 978-1-59485-411-8. Perkins, Dorothy (19 November 2013). Encyclopedia of China: History and Culture. Taylor & Francis. ISBN 978-1-135-93569-6. Powers, John (25 December 2007). Introduction to Tibetan Buddhism. Snow Lion Publications. ISBN 978-1-55939-835-0. Representatives, Australia. Parliament. House of (1994). Parliamentary Debates Australia: House of Representatives. Commonwealth Government Printer. Service, United States. Foreign Broadcast Information (1983). Daily Report: People's Republic of China. National Technical Information Service. Vitali, Roberto. 1990. Early Temples of Central Tibet. Serindia Publications. London. ISBN 0-906026-25-3. Chapter Three: "Lhasa Jokhang and its Secret Chapel." Pages 69–88. 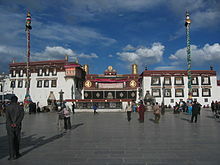 Wikimedia Commons has media related to Jokhang Temple.